A friendly holiday home, sleeping up to 10 guests, awaits families & friends for year round 'getaway' breaks! Just a mere 200 meters from one of the most popular beaches in Hermanus, close to restaurants and shops, guarantees for a perfect holiday! 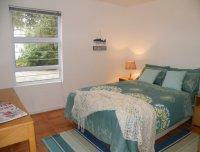 The house has five comfortable en suite bedrooms. There are two lounges downstairs, one opening onto the shaded outside braai area. Upstairs there is a very spacious, comfortable lounge with a kitchenette, and balcony with a view of the Atlantic Ocean. Payment of balance due 14 days prior to arrival. There is a once-off cleaning fee of R500. Protea 29 was perfect for our large family gathering. It was lovely to have the privacy of an ensuite for each of the 5 bedrooms, plus plenty of space in the house to spread ourselves out while stuck indoors on a cold wet weekend. It was well equipped, with plenty of fridge space, cooking utensils, and a bbq/braii plus gas heaters and plenty of spare blankets to keep warm. Great location too. We all had a wonderful weekend. Protea 29 is 0.5km from the centre of Onrus , the nearest airport 81.5km (Cape Town International Airport).